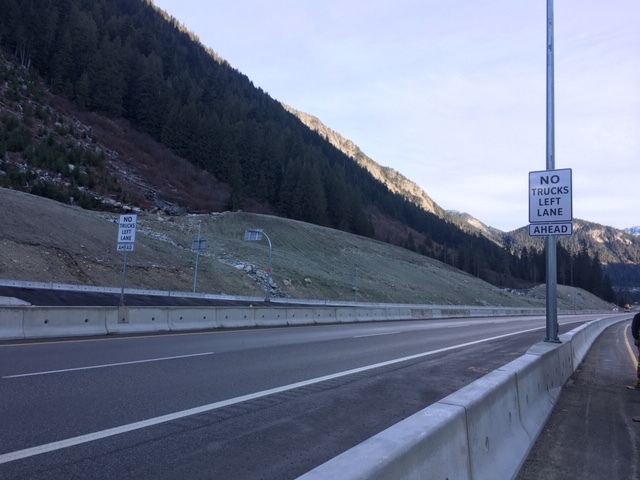 Starting this week, we are restricting commercial vehicles from using the far left lane northbound on the Coquihalla’s Snowshed Hill between Box Canyon and Zopkios with our No Trucks in the Left Lane pilot program (other select routes in the Interior to possibly follow). The restriction is in effect year-round. 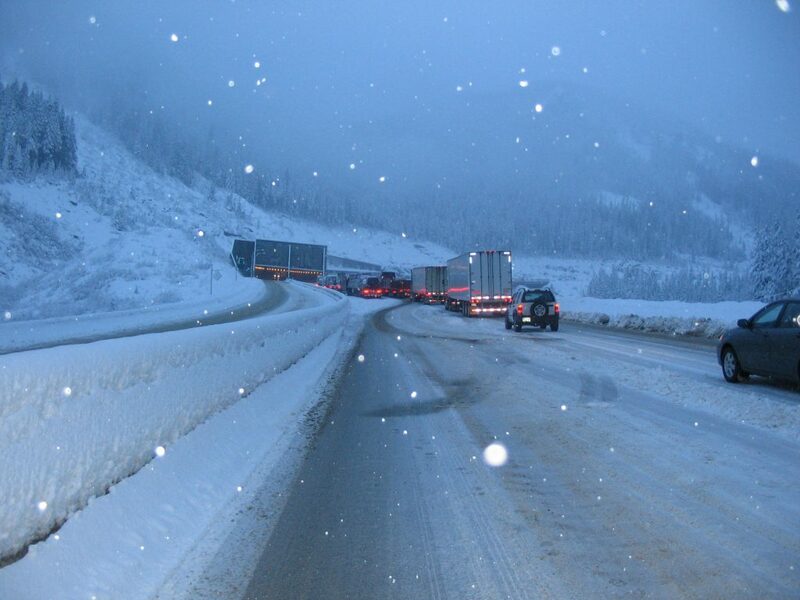 The Coquihalla Highway is one of the province’s busiest mountain passes. Both passenger and commercial vehicles rely on it as a primary connection between the Lower Mainland and the Interior. It also experiences extreme snowfall rates, with accumulation sometimes exceeding 10 cm per hour. That’s a LOT of white stuff coming down. Even with regular plowing and sanding; snow and slush accumulates on the road surface quickly, reducing traction and visibility. Add a spun out commercial vehicle (or more) to the mix and things can get messy really quickly. WHY ARE WE FOCUSSING ON THE COQUIHALLA? On Phase 1, between Hope and Merritt, the snow is heavy and wet, creating tricky road conditions for trucks, even with minor accumulations on the road surface. Over the past couple of winter seasons, commercial vehicles on the Coquihalla have been spinning out in climbing sections more frequently during storms. 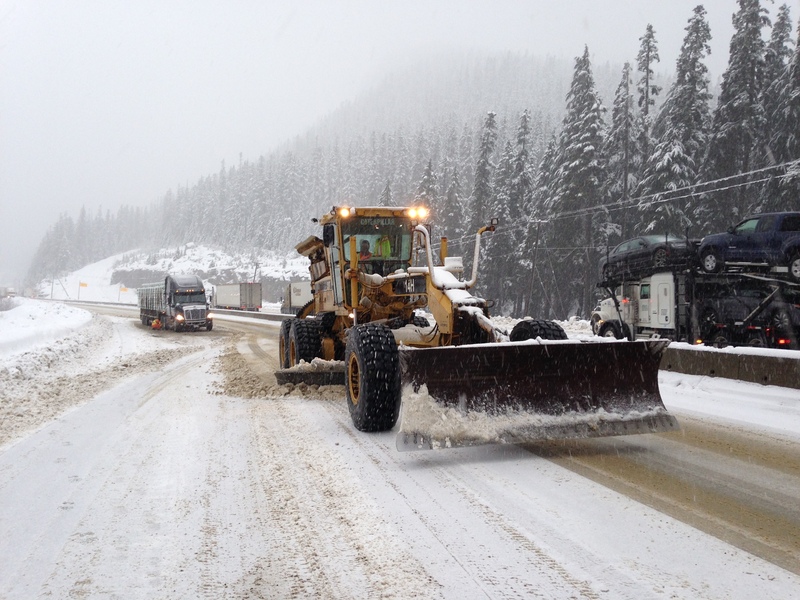 In fact, last winter, 33 of 35 extended closures on the Coquihalla during last winter involved commercial vehicles. At times this meant commercial vehicles were blocking the highway until they could either be towed away, or equipped with chains (which they should have already had on their vehicles). What makes these closures even worse is that, because the Coquihalla is a divided highway, snow plows often get caught in the traffic queue behind the blockage, restricted by roadside barriers and unable to turn around. So, snow continues to fall, unplowed, until the blockage is cleared. Not good. We hope to prevent a repeat of that trend this year by restricting commercial vehicles from using the far left lane on Snowshed Hill, which is a three-lane section of highway. The No Trucks in the Left Lane pilot program is launching on the Coquihalla’s Snowshed Hill (between Box Canyon and Zopkios) this week, with other select routes in the Interior to possibly follow. We’ve chosen to pilot this restriction on Snowshed Hill specifically, because our Commercial Vehicle Safety Enforcement focuses a large part of their enforcement efforts on this location during the winter months and this is the location where trucks spin out the most. By restricting trucks from the left most lane, we will be better able to maintain traffic flow (including emergency vehicles) and plowing operations, as well as significantly reduce the time it takes to re-establish the flow of traffic after a vehicle incident/closure. “Keep right, let others pass” rules are still in effect – we are taking this action to ensure no trucks use the left most lane. We’ve also recently constructed and opened the Box Canyon Chain-up area (located on the Coquihalla, before Snowshed Hill). We’re expecting commercial vehicles to use this facility when snow falls on the Coquihalla, in advance of heading over the summit. The facility can hold up to 70 commercial vehicles at a time and can also accommodate oversized loads as well. If we have Coquihalla Snowshed Protocol activated, and the two lanes get blocked by spun-out trucks, we will hold trucks at the Box Canyon Chain-up area until these lanes are clear. If trucks come upon spun out trucks in the right and centre lanes, they need to stop, just like they would have to if all three lanes were blocked. The safety and mobility of the travelling public are our top priorities. We hope that this change will help both of these over the coming winter on the Coquihalla. If you have any questions about this, or any other work we do at the Ministry of Transportation and Infrastructure, let us know in the comments below. Safe travels everyone! Trucks that spun out of control in last 2 year period should MUST have a sign on the truck behind AND in front just like the N sign for novice drivers. This will alert other drivers to keep a little more distance and assist in any way. This should be also a rule for regular drivers involved in more serious accidents of their own doing. An orange sign I think, or a red, but I prefer the orange. I remember in Europe an orange sign with an exclamation mark on it, and there were restrictions associated with the bearer of “the orange”, and enforced! IDENTIFYING AT ALL TIMES Problematic drivers should help all of us with safety and ultimately help the overall driving conditions. I find it ridiculous and stupid that this is not happening. Thanks for your suggestion about requiring commercial vehicles/drivers who have spun out of control to have their vehicle placarded with an orange sign, which would have restrictions associated with it. I will forward your comments to our Commercial Vehicle Safety and Enforcement group for consideration. I want to thank you for making the new rule, it makes sense not to have big rigs having to go so fast in the left lane.I was wondering, if there could be more white high-lighter things closer together on the right side? And more white or red reflectors on the meridian? We dont drive the Coquihalla often but today around 4pm, more high-lighter reflectors would’ve been less sketchy to follow. Otherwise it was a quick safe drive. We’ll pass along your lighting suggestion to the local district. I support the pilot program. I noted Kevin’s remark (Nov 18) about releasing trucks back onto a reopened highway and the associated risks of a huge concentration of same, ‘all at once’. While I agree with that (very legitimate) concern, I suggest upon reopening the highway that trucks ready to go be released a timed intervals so as to impose at least a starting distance between them. As for the remark about light or empty trucks being able to pass in the left lane, I respectfully disagree based, principally, on the relative lack of manoeuvrability of the larger rigs. Thanks for your feedback Brian – we appreciate everyone’s perspectives on this very important topic. Safe travels. My question is… what happens if a truck spins out and it lands in the left hand lane, do we still pass in the two right hand lanes? We work to clear the highway, possibly closing it to do so. Depends on the situation. Overall, this seems like a sensible policy, especially if there are three or more lanes in the same direction. On all the commenters asking for slower trucks, there’s some evidence that differing road speeds are a contributing factor to most freeway collisions. Travelling in some parts of California with heavy truck traffic,especially Interstate 5 between Los Angeles and Stockton the 55 mph trucks and the 70 mph cars on a two lane freeway make for a very stressful drive, with frustrations of being trapped at 55 mph meaning drivers often speed, making it even more stressful and dangerous for the rest of us. The adjustable speed limits are a good innovation, the speed zones need to be smaller to reflect immediate conditions and more adjustable signs need to be installed to reinforce any speed changes. The 97c connector could use adjustable speeds, especially in the frequently foggy section near Kelowna. 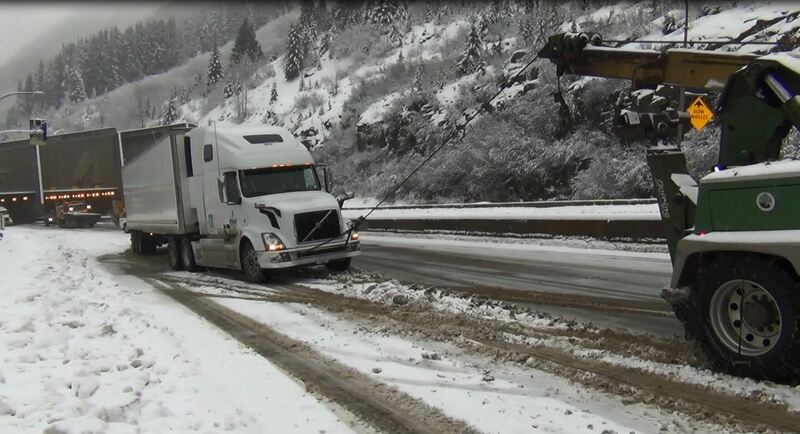 And finally, maybe a part of the class 1 driver exam should include proper chain installation. Thanks for your thoughtful comment Doug. Our traffic engineers have identified the same safety risks with mixed vehicle speeds. We appreciate your feedback and will share it forward on your behalf. Safe travels. This is a Pilot program correct? So that means a full study of the findings? Please include the FULL study in your report including the results of any accidents, or head on collisions from the Coquihalla clear to Calgary that could possibly occur after 100 trucks are finally released when the highway opens again. We all know how dangerous the highways become after they are reopened to let traffic flow. So now you’ll be creating your own “Avalanches” of traffic. Nobody condones the actions aggressive drivers take, but a backed up highway of trucks will only further encourage high risk behavior from others. (Mostly impatient cars). unfortunately, this is a reality. Safety doesn’t and shouldn’t ever mean more rules and regulations without understanding the full consequences. Safety is about education. A safe highway is a moving highway. I’m glad you understand that, but for every action there are consequences. You’ll be essentially backing up truck traffic now right? So when that truck traffic is finally released, it will create a dangerous situation for the next few hundred km until it starts to spread out again after a few cities and towns. Is this really the “Right” thing to do? Did you actually receive any consultation from trucking groups or drivers on this? To implement such a plan involves weighting all the positive and negative outcomes from this plan. Why not implement an obstruction law with a massive fine? I mentioned about the “Right” thing to do. If a light or empty truck is maintaining safe and reasonable speeds, they should be allowed to use that lane. What gives you the right to now “Obstruct” every truck because of a few that make bad calls? Practical wisdom dictates that If I’m traveling up that section at the speed limit or close to it, and 2 fully loaded b-trains are passing one another at 25 km/hr, I’m going to check my mirror and if I see nothing coming to obstruct, I will continue around safely. That is called doing the right thing, at the right time, and for the right reason. Quit trying to apply standardized laws to things that aren’t standard. quit trying to force the square block in the round hole. Ticket those that obstruct and leave the drivers that operate with practical wisdom alone. Let’s also consider all the idiots that will disobey this law. Then add one more danger as every car driver pulls out their cell phone to take pictures and video. Let’s just take something dangerous and add more dangers too it. Don’t you have any empathy to predict outcome? Thanks for your great comment Kevin. We have shared it forward for review and response. Stay tuned. While some of the published comments have substance in certain instances, in the overall scheme of things I believe it is the right path to take. I would also like to take this opportunity to mention that truck speeds over 100k should be 10k slower than passenger or light truck vehicles. I have personally been passed by a loaded B-train in my personal vehicle going down Loon Lake/Elkhart while I was doing 110k. This person is an accident looking for a place to happen. Hello Gino and thank you for your comments. We appreciate hearing from you on this topic. Thanks for your comment Werner – we appreciate hearing from you. This location has been selected as a pilot project and if it is successful, it will be considered for other locations across the province. We are team truck drivers BC to Toronto several times a week and the BC roads are the worst kept. You never see a plow with its blades down.You see salt sometimes but that’s not the answer. Get the plows out. Perhaps this should be looked at more so than restricting us truckers from the left lane especially if 2 slower trucks in the right 2 lanes. There will be more problems, back ups and frustration guaranteed. People need to stop blaming truckers for all the problems and consider how frustrating it is when they limit our safe gap, stopping distance by cutting in front of us and braking! We cannot stop quickly, do you not realize that? Yes training new Truck drivers better needs to be addressed but how about giving the brand new drivers training on how to respect truckers on the road and be aware of how much room on the road we require to be safe for us and others. Hahaha. Bc will start to run out of food and product. Idiots it all travels by trucks, everything. Yes, a lot of goods travel by trucks. Important to keep the highway open then, right? Ensuring the left lane remains unblocked prevents lengthy closures and allows maintenance vehicles to clear the highway. Great solution. Fully support it. Please implement the same policy wherever there are 3 lanes. #BCHwy1 EB 232-264 #BCHwy1 both directions west of 200th #BCHwy1 Wb from my Lehman up the chill. Thanks for the comment, Greg. This is a pilot program. More three-lane sections of highway may be included in the future. Oddly enough, when the third lane eastbound from 232 St. to 264 St. was built it was claimed to be a truck climbing lane and the signs said as much, as was the third right more lane from Mt. Leahman Road up to the Brander road area. Trucks should be made to stay in those lanes going up both those hills however as I live in the Fraser Valley, they seem to be able to use even the left lane and slow everyone else up. In some states south of us commercial vehicles over a certain weight aren’t allowed to even think about using the left lane. Why is it just a pilot project here and not a full on implementation? Just curious is all. If the trial is successful, it will be implemented in other areas as well. Thanks for your comment Tom. Our local staff closely oversee and work with our maintenance contractors and the services they deliver, through a continual auditing process. This is good news but as previous post state it should be extended. The Heavy trucks should not be allowed in ALL left lanes. Hwy 1 , Lougheed Hwy, and all others. Too many times 2 tractors try to pass each other where 1 is trying to go 2 km/h faster in the left lane and just can’t make it. So drivers behind them get angry, frustrated and start making sudden moves to try to get around them. This is the law in many US states and most of Europe. And it works. Make ALL Highways in BC a NO TRUCK in LEFT LANE. Save Lives. Two things. First off, why is it not mandatory for commercial vehicles to be running winter tires on the drives? They make a HUGE difference in traction and would help solve some of the spun out issues. Second, if I’m heading up the smasher chained up and the right two lanes are blocked from spun out vehicles but the left lane is open, I’m supposed to stop? Now I’ll be essentially spun out too. Hi Tim. Winter tires are not manufactured for most commercial vehicles. As far as using the left lane with chains installed – no, that is still not allowed. Trucks with chains can still spin out. The priority is to keep a lane open to allow traffic to continue to flow, including maintenance equipment. Hello Annoyed – thanks for your comment. Our maintenance contractors work around the clock to keep the highway clear and open. The main thing that people should understand about the Coq (and the same applies to all the other mountain passes in BC to greater or lesser extents) is that, in certain circumstances, snowfall intensity and accumulation rates can be extreme – sometimes exceeding 10 cm per hour. A great example of this type of intense accumulation occurred during February of 2014 when ten storm systems delivered a total of 294 cm of new snow over a period of 15 days! The traffic and road conditions resulting from this type of weather may be unpredictable – even with our maintenance crews out there throwing everything they’re got at it. This restriction will help keep at least one lane open, so that our maintenance vehicles can continue to clear the highway. Hope that this helps. Maybe we should look at this in a different approach!maybe the truck need’s to be designed in a better traction system,four wheel drive, trailer’s with a drive system on the back wheel’s!, I mean we can send a man to the moon, why can’t a truck be designed for winter driving? thought’s? If 2 trucks are spun out beside each other, will other trucks be allowed to go around or are they forced to get stuck as well? Hi Scott. No, other trucks must stop, ensuring the left lane remains open. Otherwise, these trucks could very well spin-out in the left lane, thus closing the highway. It needs to be clarified whether trucks that are chained up can use the fast lane should both slow lanes be blocked. These wait times for multiple blocked lanes can lead to several hours. A properly chained up truck will not spin out. Some drivers don’t know how to install tire chains correctly. If the ministry or CVSE or ICBC would set up a training program/video this would speed things up and let everyone go home safely. It would be an idea for hiway maintenance people/traffic control to have someone who can be paid per customer at the chain up area to help out someone who doesn’t know how to chain up. VSA does not maintain the crucial hills as well as Emil Anderson does on hiway 3 hope princeton. It is the hills that are the problem, not so much the flats. The “smasher” can be plowed much more efficiently. I know from professional experience hauling Super’Bs on both the coquhalla and hope princeton, both get the same wet snow. Only if we work together can we go home safely and not be ignorant of each others perspectives. We all pay with out taxes for proper road maintenance, we need more Snow plows on the short steep hills, snowplows that actually press down with their blades. We dont want to hear about someone dying every winter on “hiway thru hell”. Tow trucks and hearse drivers might be unhappy but everyone else will be much happier and feel much safer. Hi Maurice. Commercial vehicles, with or without chains installed, cannot use the left lane northbound from Box Canyon to Zopkios. Chains do not completely erase the risk of spinning out, especially if driver inexperience or mechanical issues are involved. Thanks for your suggestion about training. ICBC is reviewing the current Class 1 commercial driver training program in BC, and will be looking at the recommendations from that review to see what improvements can be made. I agree with other commentators – we should look to expand to all multi lane highways particularly in the lower mainland and follow European countries in having commercial vehicles travel 10km/hr slower than other traffic and keep them in the far right lane except under exceptional circumstances to pass – which should be limited since they are travelling slower. Driving in winter conditions is never easy. Could someone please come up with serious outside-the-box suggestions about how to prevent the snow from landing on the road in the first place. We did put a man on the moon… It must be possible to keep snow off the road. What a pile of crap! You guys sit back and act as though you have no control over the situation, in fact if you’d all stop passing the buck and take responsibility for giving commercial licenses to the inept, at that point we might regain a modicum of professionalism in th industry. I as most of the high quality professionals I know sick and tired of being treated as the problem – we all get tarred with the same brush as the incompetent license holding twits you and your government employees union colleagues put behind the wheel!!! Shame on you, you have turned us against each other and you sit just back and watch us fight it out. You don’t even realize that some drivers are up all night just so you can pick up your frickin garden hose or latte’ tomorrow morning and if they’re late….. they are reprimanded, doesn’t matter what the road conditions were. Yes trucks spin put in the snow, how come these twits don’t know how to install chains???? That’s on you BC government- you do t demand they know how – do you. No you don’t!? Ray Charles could see what the problem is here. Take our tax dollars and ride your career into golden retirement – despicable creatures you are. Thanks for sharing your concerns, Larry. While inconvenient for commercial truck drivers, this pilot program is intended to significantly improve the reliability of the highway for passenger vehicles, as 33 of 35 closures last winter involved commercial vehicles. Also, this type of restriction is implemented on three lane sections in many other jurisdictions. The Ministry of Attorney General oversees training. ICBC is reviewing the current Class 1 commercial driver training program in BC, and will be looking at the recommendations from that review to see what improvements can be made. You say ICBC is reviewing, and will be looking at the recommendations from that review. Who will be making these recommendations? I am in discussion with a group of career drivers, I think most of us have 30 plus years of driving. A few of us own and operate medium/large trucking companies, and one of us owns a reputable truck driver training institute. We want to be included in this process, as we have concerns about the curriculum. Our goal is, class 1 drivers who are trained to OPERATE a complex piece of machinery, not just steer it without understanding it. If they can understand it, and operate it, highway safety, courtesy for others, increased productivity, and likely an increase in that drivers wages, will be byproducts of the initial preparation of that driver. ICBC is being offered a golden opportunity to tap into a storehouse of knowledge. These are guys with intimate knowledge of trucks, trucking, and truck driving. It could be a win win for ICBC. I assure you, a lot of these guys are the best in the biz. Hello James and thanks for your comment and interest in this initiative. We have sent your comment to our contact in the CVSE and will let you know what we hear back. The last time I chained up on the hill was because your system of notification is very poor. There was no notification at the hunter creek highway signs and no chain up required on the BC highways commercial truck chain up web site. My wife was monitoring the web site right up to the flashing lights at box canyon. I would have avoided the coq if your system worked. And the same thing has happened when the highway was closed because of an accident. The hunter creek sign said the hwy 5 closed, the hope sign said hwy 5 open, and so did drive bc- hwy 5 open. Never trust vsa or bc hwy’s. And everybody knows what vsa stands for! Thanks for sharing your experience. I will pass it on to local staff. I don’t know the circumstances around this particular event, but weather can change very quickly, especially through mountain passes. Knowing how to chain up should be mandatory for all commercial drivers. For all those on this thread citing European regulations, please consider that their geographic size and transportation networks are vastly different from our own. They have substantially less truck traffic over a such a long distance. That said, countries like Switzerland are often cited as far more efficient with their snow removal then we are in Western Canada. Being smaller but dense, they have less highway and thus more finances to support it. The Coquihalla highway is a primary corridor for commerce into the largest city in Western Canada. The number of trucks running back and forth is far greater than the average layperson understands. To throttle the transportation network will have negative economic impact across the board. Instead the direction should be at improving our highway maintenance programs. This requires funding. How do we get funding? Implement tolls back onto this highway and utilize the revenue to provide proper, thorough snow removal. This is not a foreign idea and is used throughout Europe and parts of the U.S.
For those of you forming a lynch mob, I work in professional commercial transportation and know very well the cost this adds to operations. For those who would complain about the extra cost of crossing this mountain, take the Canyon. The frequent closures on this corridor have resulted in economic damages throughout the province, as suppliers wait, transportation companies sit, perishable goods wither and freight is missed. This all impacts the consumer at the far end. A toll payment is a small price to pay to reduce the casualties on this stretch of road and I know several prominent transportation companies that would agree with me. I would be happy to pay if it meant clean, clear roads and peace of mind for everyone in their travels. Commercial drivers who refuse to put chains on and then become stuck should receive a heavy fine plus a hefty towing fee. Repeat offenders should get double the fine. Police should also be nailing these people who don’t who don’t slow down for emergency vehicles and tow truck drivers. Thanks for your comments William! This action can and will cause problems. What is a truck to do if some trucks spins out in the right lanes and only the left lane is open ? Is that truck to stop behind those trucks on use the left open lan and go. Stuff like this is not the answer to the problem. What is the answer have the road maintenance look after the hwy like they use to before the tolls were removed and contacted it out. Also how about turning on the old heating system they built into the road . Hi Colin. One of the key reasons we are doing this pilot is because we have seen so many instances where one truck spins out, the next truck spins out in the centre lane, and then another blocks the left lane – completely shutting down the highway. If trucks come upon spun-out trucks in the right and centre lanes, they need to stop, just like they would have to if all three lanes were blocked. 1) The heating cable would corrode and break, creating heated spots and cold spots. We had to break out the concrete in order to conduct repairs. 2) The approaches were heated and the tunnel wasn’t. The melt water would refreeze in the tunnel, causing its own safety problems. 3) Electricity costs were very high. What you don’t seem to understand is the laws of physics override the laws of thevBC government ! Momentum is an important part of driving a truck so if I am going up the highway with empty b trains at 65 km and come upon two slower trucks in the two right lanes doing 40 km I have to go around them . The way you maintain that hill if I slow to under 40 km empty I will spin out when the chain up signs are off !!! Hello Robin – thanks for sharing your concern with us. The “keep right, let others pass” rules are still in effect – we are taking this action to ensure no trucks use the left most lane. Hope that this helps clarify. This is going to cause more spin outs. If two loaded trucks are in the center and far right lane doing 15-30kph, what’s the truck that’s travelling empty or that has a lighter load coming up behind them at 70kph+ (depending on conditions) supposed to do? If he slows down to the speed of the truck in the center lane, waiting for him to make the pass, he’ll spin out. Conditions don’t even have to be treacherous and chain up lights don’t even have to be on for this to happen; only a little bit of ice, slush or snow on the highway. Trucks use momentum in these scenarios to avoid spinning out and to maintain traction. Jamie Davis and Al Quiring are going to be busy rescuing these trucks now because BC told them to stay out of the left lane….. Scenario #2. What if it’s a perfect winter day. Dry roads, sun is shining, temperatures on the plus side, trucks still can’t use the left lane? Again, if there’s a truck in the right lane and the center lane doing 15-30kph and a truck coming behind them doing the speed limit (or close to) has to jam on his brakes and wait for the center truck to make his pass? If the trucker is maintaining highway speeds what gives cars and passenger vehicles more rights than trucks? Hi Mark. Keep right let others pass law still applies. The right lane should be used for slower traffic, and the centre lane for passing. Agree with the change and also support looking at other locations. The 3 lane section on Hwy #1 heading east from 232nd would be another location. Also strongly support the overall concept which is what I have experienced when driving in the UK which also restricts trucks from using the left lane. Note that driving in England is generally a world class experience for courtesy, and overall skill of the motorists. Thanks for your feedback Phil! In regard to trucks not using the left lanes; how about “trucks use left lane”, seems crazy that all of you educated bunch can’t figure out that making these behemoths slow down and then try to regain speed every ten seconds is harmful to the environment, a complete waste of fossil fuel and energy. Considering that most of us are not stopping for the next 100-500 miles, and most of you are getting off at the next bloody exit…. now which of us isn’t being green? Not my fault that you have no patience nor tolerance. It should be year round. No commercial vehicles in the left lane. Thanks for this feedback David – we have noted your comment. So when a slow set of b-trains is doing 10km up the hill , I’m not going to be able to pass him ? That will cause more spin outs ! And back ups ! Hi Darren – thanks for your comment and we understand your concern. “Keep right, let others pass” rules are still in effect. We simply want to ensure no trucks use the left most lane. Hope that this helps. You obviously have no clue! Nice generic answer for the comments. I run the Coq 3 times a week. Maybe ICBC should quit giving licences to inexperienced drivers who have no sense of what snow can do. More incompetence coming from the BC government. The trucking industry is already so over regulated it’s pathetic. After 34 years(safe years) I’m pretty much done with stupid people making stupid decisions on our hways. Are you saying that trucks that spun out should have had chains in before they spun out ??? You guys are the ones that turn on the chain up lights , you guys are the ones that maintain the Hwy , the question I have is why aren’t you doing a better job of maintaining the Hwy and Turning on the chain up lights sooner. As I hope you know . The weather at box canyon chain up area can be much different then the weather when exiting the shed . While I get what you are doing with restricting the far left lane and I fully agree. I truly hope you are not laying all the blame on the truckers because really it’s up to you to make sure the road is maintained and fit for travel . That includes making sure the chain up lights are on so the drivers of large vehicles can know that the road conditions beyond from what they can see is not ideal. We absolutely value the skills and commitment of the professional drivers who use BC highways and we take the safety of the travelling public very seriously. We work closely with our maintenance contractors to ensure our highways are well taken care of. We have several signs leading up to our Box Canyon Chain Up facility that identify the chain up area, as well as a flashing sign that indicates when trucks are required to chain up. Our CVSE attend protocol events, where more than 15cm of snow is forecast in a 12 hour period (when mandatory chain up is anticipated). The CVSE officers are positioned at the exit of the chain up facility, as they can only enforce violations, and a violation only occurs when a truck passes the exit of the facility without having chained up. Hope that this helps. IF there is a storm that is creating/going to create problems, would it not be worth closing the highway for as long as necessary to have 3 snowplows behind/beside each other to clear the road in one run, or make all vehicles travel behind the 3 snowplows so they could do their job efficiently? I remember the days we used to see that happen, and I don’t recall near as many closures. Perhaps when there’s a storm and chains are mandatory a CVSE vehicle should be at the chainup areas to ensure the commercial vehicles are stopping to put their chains on. The cost of having someone sit there I’m sure is far less than the cost of highway closures – whether for accident, spinout, etc. Our maintenance contractors do still run three abreast to clear the road whenever possible/required. The main thing that people should understand about the Coq (and the same applies to all the other mountain passes in BC to greater or lesser extents) is that, in certain circumstances, snowfall intensity and accumulation rates can be extreme – sometimes exceeding 10 cm per hour. A great example of this type of intense accumulation occurred during February of 2014 when ten storm systems delivered a total of 294 cm of new snow over a period of 15 days! The traffic and road conditions resulting from this type of weather may be unpredictable – even with our maintenance crews out there throwing everything they’re got at it. Don’t let that worry you though – VSA Highway Maintenance, our maintenance contractor for the route, has a plan. It’s called “the Coquihalla Protocol” and it comes into effect when more than 15-20 cm of snowfall over a 12 hour period (or freezing rain conditions) are predicted and its sole purpose is to make sure we maintain safe and uninterrupted travel through the corridor during heavy snowfall or other challenging weather event. We have several signs leading up to the Box Canyon Chain Up facility that identify the chain up area, and a flashing sign that indicates when trucks are required to chain up. Our traffic control typically sets up within the chain up area to ensure the site is managed efficiently. Our CVSE also attend protocol events when mandatory chain up is anticipated. The CVSE officers are positioned at the exit of the chain up facility, as they can only enforce violations, and a violation only occurs when a truck passes the exit of the facility without having chained up. I am a regular user of the Coquihalla as a transport drive. My wife and I both want to thank you for your continued efforts to make ALL of our British Columbia road safer. Doing this task takes administrative leadership and some decisions are not well received by our trucking industr, but most of us know that the Ministry has our life’s and safety in mind when they are overseeing the whole aspect of safety on our road. I always hear some drivers complain about the maintenance of the road during winter season, that the road are not plowed enough or not enough clearing of the snow and gravel. But will all know that these complaints come from the many man (many) drivers who are new, inexperienced and just plain lazy to set themselves up for a safer ride up chaining up, slowing down or just STOP safely pull over with their lights flashing and wait out the storm. Relax and have a coffe. Remember it is just a job. Thanks and please continue to do everything necessary to keep our roads safety including much more enforcement. Thank you for this Mr. Cipparrone – we truly appreciate hearing your positive feedback and your healthy motto! Have you ever pulled over because Of some snow and waited it out only to be stuck for 3 days becaus the coq received 70inches …nope I guess not . Glad to hear you approve Christine! Ministry of Transportation should look into commercial traffic practices in Europe where they also restrict commercial traffic to 90 km/hr, no exceptions and electronically monitored for improved safety of all types of traffic. Thanks for this feedback Frank – we have sent it to our traffic engineers for review. Please apply the rule to ALL 4 lane BC highways. Great idea. The speeding, aggressive truck drivers that seemingly don’t care about the lives of the general public really need to be stopped/controlled. They’re getting more and more reckless. Absolutely insane how they get away with it. What denotes a ‘professional driver’ anyway? Not too many act or drive professionally. The proficiency of truck drivers would increase exponentially when the stop putting class 1 licenses in boxes of Cracker Jack, Shreddies, and Count Chocula. Annother useless rule because we dont enforce the ones we already have, what makes this one different? This is good news. I travel #5 frequently and frequently get stuck behind a truck going a kph quicker than the other truck he’s trying to pass. I understand a big rig goes slow up big long hills, but just cause congestion when they attempt to pass. Stay in the right lane and traffic will flow mych better. Thanks for the positive feedback Donna!